Benicar is a widely-used treatment for patients with high blood pressure. Approved in 2002 by the U.S. Food and Drug Administration (FDA), the drug is distributed by Daiichi Sankyo, Inc., and belongs to a class of products known as angiotensin II receptor blockers (ARB). Benicar is the product name for olmesartan, a medication that works to control blood pressure by inhibiting the release of angiotensin II, a natural protein made by the body that causes blood vessels to narrow and make it more difficult to pump blood. Olmesartan blocks angiotensin, which allows the blood to flow regularly. 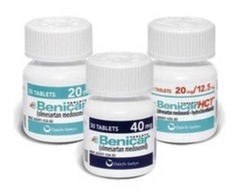 Benicar is typically prescribed by doctors either on its own or in combination with other drugs that include olmesartan, such as Ozar, Tribenzor and/or Benicar HCT. Individuals who take a Benicar high blood pressure medication may suffer a myriad of serious and painful complications. On July 3, 2013, the U.S. Food and Drug Administration (FDA) issued a Safety Communication that ordered a label change on Benicar, Benicar HCT, Azor and Tribenzor, to include olmesartan’s association with sprue-like enteropathy. The FDA said in its July 2013 warning that it would continue to investigate issues associated with Benicar high blood pressure medications, as well as others that contain olmesartan. The agency also vowed to communicate any new information to the public as it became available. Gastrointestinal side effects of Benicar are similar to those exhibited by patients with Celiac disease, a weight allergy to a protein included in most grains. These issues may be dangerous in Benicar patients, especially if they lead to malnutrition. A year before the FDA ordered a label change on Benicar and other high blood pressure medications, the agency received notice from researchers at Mayo Clinic, who urged them to explore the risk for gastrointestinal problems. Between 2008 and 2011, Mayo Clinic looked at 22 patients who had gastrointestinal problems common to Celiac patients—including chronic diarrhea, weight loss and the malabsorption of nutrients, among others. All the patients tested negative for the disease, but were all taking Benicar at the time. The Mayo Clinic study was published in August 2012, and also found that no other ABR drug caused these gastrointestinal problems. As such, doctors should prescribe olmesartan with care. Court records indicate that a number of Benicar lawsuits have already been filed by individuals who sustained serious gastrointestinal problems caused by the high blood pressure medication. These claims accuse Daiichi Sankyo, Inc. of negligence in testing its product for safety, and failing to adequately warn consumers about its risks. If you or a loved one suffered chronic and severe diarrhea, weight loss and other issues that may lead to malnutrition, please call the law firm of Bernstein Liebhard LLP. Our attorneys are here to help you navigate your legal rights in filing a claim.